Learn to throw rapid flurries like Sugar Ray Leonard. Surprise your opponents with these lightning fast 10-punch combinations. A shoeshine combination is a flurry of quick little punches. Their emphasis is purely on speed. Shoeshine flurries are often thrown with improper punching technique, but pure speed sometimes gets the job done. The reason why it’s called a shoeshine combinations is because your hands are held in a vertical manner as your fists go up and down, similar to two hands polishing a shoe with a cloth. 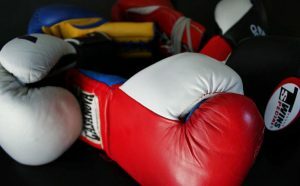 Some boxers describe it as multiple quickly little uppercuts designed to dig under your opponent’s elbows OR lift his head up to be chopped off with a left hook. The shoeshine combination is all about speed. Forget what you learned about proper punching form and technique. The key to fast punching is to coordinate your hands and feet to move in unison. First off, we learn some basic footwork drills. Bounce up and down on the balls of your foot, shifting your weight from one foot to the other. Shift your weight side to side, bouncing WITHOUT lifting your feet or your hips. Notice how my feet stay planted now. You do the same drill as before, lifting your heels as you “jump” side to side but you don’t lift the balls of your feet off the ground. MORE IMPORTANTLY, keep your hips down! As you bounce your weight from one feet to another, try not to let your hips “jump” up. (Your hips will “jump” up regardless, but you want to keep them as low as possible.) Keeping the hips down adds power to your flurry. Don’t forget to exhale on every bounce. Next, add some punches. You throw a single punch for each bounce, coordinating your hand movement with your foot movement. You’re not throwing at fully speed, you’re simply bounce-shuffling and throwing a short punch for each bounce. (Just punch at the air when practicing.) This is just a drill for you to get use to moving your hands and feet together. The REAL trick is for you to do this relaxed. You should feel your legs and hips SLIGHTLY tense and un-tense as you shuffle-bounce back and forth. Try shuffle-bouncing as you move across the gym (remembering to keep your feet touching the ground the whole time). 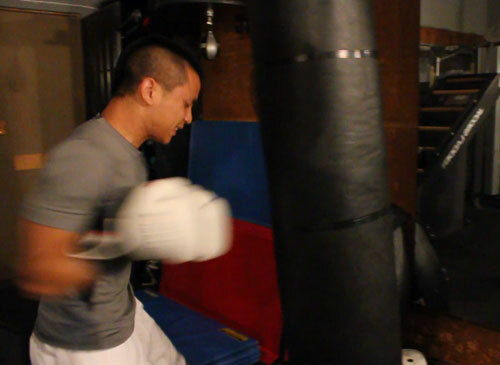 Try punching a heavy bag or even a double-end bag. Don’t just shuffle in one spot, move around the bag as you punch it with your shuffle rhythm. Try to shuffle in a relaxed manner that allows you to shift your weight quickly without getting tired. The shuffle drill is great for developing footwork ability (even if you don’t like shoeshine combinations). I do this drill 80% of the time when I’m watching other fighters spar. I’ll even do it while shadow-boxing, waiting in line at McDonalds, or even in between rounds. You’ll NEVER catch me standing still and doing nothing. I owe my awesome footwork abilities to this drill. Watch Manny Pacquiao’s feet when he shadowboxes and you will see that he’s also shuffling his feet very quickly as he moves around the ring. Fast hands deliver fast punches. Fast feet deliver fast power! Ok, now let’s try it on the bag! Stand square at the bag and throw flurries of 10-15 little punches up the middle. Do it slow at first, and then full speed with quickly little punches and rapid bouncing of the feet. Don’t forget to exhale on each punch. Your breathing should sound like a machine gun. You can throw it to get an inside fighter off of you. Or maybe you want to push an opponent into the ropes. Or maybe he’s got slow hands and you just want to hammer him all over the place. Another great time to use it is when you have a fighter hiding behind a high guard or shell defense. Throw a shoeshine flurry to scare him from coming out of it. In my live demo above, I use it to interrupt my opponent’s rhythm and surprise him with rapid punches as I manuever into a better position. In the 2nd demo, I use it to pin down my opponent with a flurry to the body. 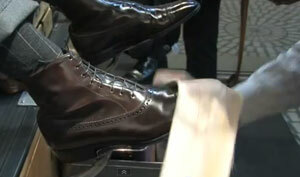 See how the pro’s throw the shoeshine combinations! All speed! The shoeshine combination is best thrown on the inside. Although the shoeshine flurry is typically used as little uppercut punches at the head, you can still throw whatever punches you want. Some guys will start at the body and shoeshine all the way up to the head. Personally, I like to throw tight hooks at the body to intimidate my opponents. Any time your opponent closes up for more than a second, it’s a great opportunity to step in and throw the shoeshine combination. He’ll most likely close into a tighter shell and give you time to look for more openings. I also like to flurry as a counter punch. What I’ll do is sit there with a shell defense and wait for my opponent to throw the first punch. It doesn’t matter what his first punch is, I immediately respond with a flurry and interrupt the rest of his combination. It sounds so simple but it really works, just try it. The speed of your flurry will surprise him! Some boxers don’t believe in the shoeshine flurry; they think the punches don’t hurt. Don’t worry about not punching hard enough. Think of the flurry as a bunch of fast slaps. If you slap someone multiple times rapidly, the speed and REPEATED element of surprise can hurt him even if you have little power. If you got an opponent close to you with his hands up, just flurry all over him until his guard falls apart. Throwing a shoeshine combination is like throwing 20 jabs. The most important attribute of the shoeshine is speed! Keep your entire body loose. Do not try to add power! Just keep whipping out that speed and throw whatever punches you want in whatever direction you want. The important thing is that you focus on SPEED and moving your hands and feet in unison. Whatever the case may be, the shoeshine flurry can cause damage AND look good in the judges eyes. wow man! 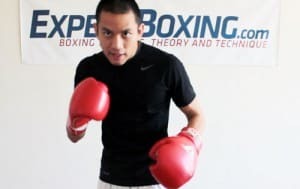 haven’t noticed before this technique on these youtube boxing videos, but now i read its a technique that can be learned, i’ll wipe out my bag. And again, thanks for all the provided tips! teaching people to be another SRL ? i like it, (the lesson not that ppl do this kind of stuff), more! and more infighting stuff coach, i wanna see if there’s stuff i missed, didnt know etc. btw i think it should be mentioned unless someone has extraordinary handspeed in combos and CAN actually throw atleast 5-7 punches a second 2 handed (i had very good sometimes very very good handspeed but i couldnt flurry even in sparring without getting a jab in my face or a stiff hook for my troubles even from somewhat slow punchers. i think only the fastEST handed fighters do well with this because theyre in range for a hook at any time and the flurry is not meant for power anyway and all experienced fighters know it. but if anyones got that speed-its pretty impossible to stop them stealing rounds this way unless they get tired or their opponents have a really long jab, catch them on the way in or something. pep ali SRL MT (meldtrick taylor) floyd’s (patterson and mayweather) roy jones pac they could pull it off because of their speed in close. guys who had fast small punches with POWER-sugar ray robinson for very fast very hard 2 hands (watch his fights against lamotta time after time), joe louis (wow the way he throw them against good fighters who got called bums cuz they were so dominated), tyson (pretty fast hands and damn if they didnt stop fighters in their tracks). all 3 dont skip at all (im sure of that) they floored opponents with multiple small shots, not AS fast as flurries but plenty fast. and not as powerful as the devastating power all 3 had, but still pretty hard punches. even roy could throw flurry like shots and put ppl for an 8 count when he used both hands (but he liked to just throw 5, 6 left hooks instead of powering up). @Saber; how was your eyes bro ? @saber – in theory, it’s easy to just push back a fighter throwing a flurry, but quite often the natural response is to cover up when you feel like you’re being touched all over the place. 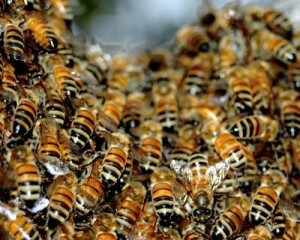 You’d have to have thick skin or a brawler attitude to ignore a flurry. Even still, the fighter throwing the flurry can easily float backwards if he shifts his feet. He won’t fall over, he’ll just step back as he maintains his foot-shifting rhythm. As for slower handed fighters, they can bring their hands closer and flurry with shorter punches to make up for the speed deficit. Proper timing of throwing the flurry and proper targeting will make it successful even if you do not possess world class speed. 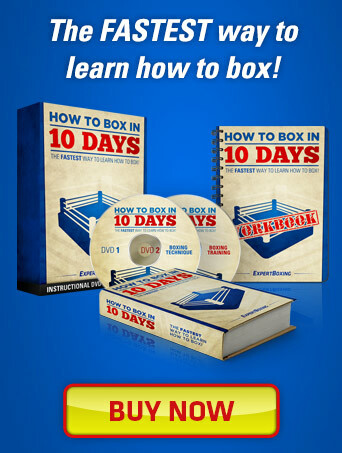 I was interested in hearing your thoughts on how to beat mayweather. And I am hoping Ortiz already knows them haha. well i was just throwing out an idea i never actually tried, flurries usually got me rolling and slipping and looking to counter quite unsuccessfully (as u said its hard not to try and cover and be correct). but if the other guy isnt really really fast we just threw something to stop the hands from connecting. cuz flurrying is quite throwing caution to the wind and depending on the other guy not trying to throw a lead shot but rather blocking or defending+countering. if someone whose hands were as fast as floyd and flurried someone who tried to slipp and roll and countered as fast as floyd against the flurry, the flurrier would win everytime. @Saber – yeah, shoving does work….that’s what happened to me in my demo, hahaha. Great article! As I read this, I started to realized I was kinda doing this on my own, but the only difference was I was doing quick-feet (old football drill) while I punched. It sounds like that if I keep my feet on the ground and my hips low, I will be faster with my hands and also move better around my oponent. I can’t wait to work on this. BTW – that demo you posted, with the hiphop music banging in the back, looked like an underground fight club… I LOVE IT! @Chris – hahaha, yeah! Everyone says it looks like fight club. Hahahaha. It’s our Friday nights where everyone just spars for fun. Not serious training and we’re allowed to goof off all we want. In this video you are suggesting that it is the movement of your feet that make you suddenly get rapid hands. Yet when you do a fast ‘shoeshine’, your feet move in the NORMAL way they should. 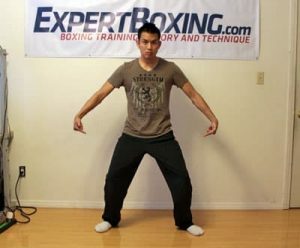 Basically, if you have been taught boxing then you should be able to do it naturally. If you are trying to learn how to box, then I dont think this shoesihne or whatever, is what you need to learn. @Smiling Assasin – the foot shuffling doesn’t give me rapid hands, it gives me rapid power. Also when I’m doing the fast shoeshine, I’m still moving them in a shuffling motion…not a full pivot as a normal punch. I’ll have to get a close-up since you saw it differently. Pivoting your feet the normal way gives it more power but definitely slows down the flurry. Sometimes I do have slower flurries with more power but in reality, you just need some up and down movement…and only slight movement. I think I’m going to have find videos of the pros who do it better than I do. There are many strategies for the shoeshine so it’s not just a flashy move that looks cool. Can you achieve the same thing by almost running in place? Like the fast feet football-type of drills where you kind of run in place without the feet leaving the ground? It seems the way you shift your weight, there is a pivot to it. Both left and right, forward and back. You kind of twist on the balls of your feet. Is what I’m seeing right? Brett, the drill is about moving your feet without lifting and dropping your hips. Running in place still lifts your hips. There MIGHT be a pivot to my ankles but I let that happen naturally. My main focus is not lifting the hips. But yes, you’re seeing it correctly. I remember learning this technique. You make it look easy, but it’s not. It looks awesome. hahaha…doesn’t that gym look awfully familiar! see you on Friday. When i attempt the shoe shine combination the best way for me to do so is to throw my punches in accordance with the rhythm of my feet. and of course focusing on keeping my hips down like you said. my question for you is that the proper way to use this technique? Yes J. Keep the hips down and punch in rhythm with the movement of your feet. Do it slow to build up the match hand & foot coordination. when you did the demonstration i noticed you placed your head on your opponents shoulder what does that do? i know, but i learned a new technique by watching you, and of course i just learned something new, so by crowding his space that limits what your opponent can do right? say johnny, when you do that quick sharp hiss sound do you do that literally every time you spar? I breathe like that every single time I punch. Yeah, push the guy into the ropes and then flurry while he’s trying to regain his balance. 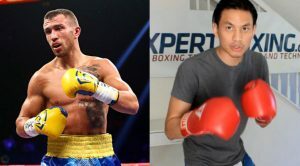 Hie coach great article.. Last time I tried to throw shoeshine punches at body , I end upp getting warning by referee that I’m hitting with my plam .